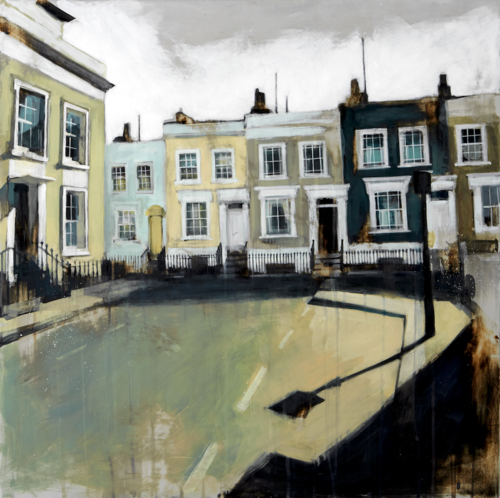 Camilla uses a refined palette of soft colours to create quiet and contemplative urban landscapes. She uses water-based paints on gesso—a porous surface which she prepares by hand and applies onto cradled boards. She then works up her drawings and reference in her studio using a mixture of paint layers - some thick, some watery, for added texture. The urban environment is mostly overpopulated and cluttered, a place we pass through but rarely stop to consider. Camilla’s work attempts to look beyond what is familiar, removing contemporaneous distraction and allowing us to see—often for the first time—the beauty of the built environment. In 2014 Camilla won Artists & Illustrators Magazine’s ‘Artist of the Year’. This was followed in 2015 by a solo exhibition of new work presented by the Jonathan Cooper Gallery in Chelsea, London. She’s been shortlisted twice for the Sunday Times Watercolour Competition, in 2015 and 2017, and won ‘The Chairman’s Purchase Prize’ at the ING Discerning Eye Exhibition in 2017.